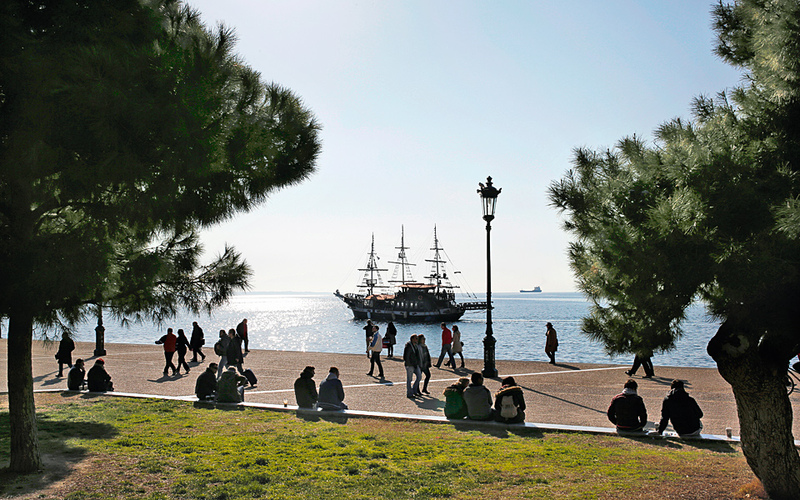 ￼Dubbed “The Bride of the Thermaic Gulf,” Thessaloniki has the privilege of a long seafront. The part between the iconic 15th century White Tower and the port, or the Old Waterfront, is where city folk congregate. The coastal promenade is a walk through the different phases of Thessaloniki’s history and architecture. The sea has always been an integral part of Thessaloniki’s attraction, both as a commercial waterway that has sustained its economy and as a privilege that few seafront cities have showcased to such advantage. The city’s orientation toward the sea is due to a great extent to the vision of Ernest Hébrard, the French urban planner and architect tasked with redesigning the center after the devastating fire of 1917. His plan may have been only partially implemented, yet what grandeur survives is thanks to his basic concept of introducing so-called classical divisions: “the rational organization and zoning of spaces for production and consumption, the selective highlighting of monuments and preservation of a number of ‘picturesque’ residential precincts,” as Aristotle University Architecture Professor Alexandra Yerolympos explains in her paper Thessaloniki Before and After Ernest Hébrard. This rationale is instantly apparent along the waterfront, the 5k stretch from the port to the concert hall. Along this route, you can become immersed in the city’s vibe in under an hour, with views of the sea and Mount Olympus seemingly cast in a peWrfect frame in the background on a clear day. To really get the taste of a city you need to visit not just its historical landmarks, but also those spots that keep adding new tales. The Palia Paralia (Old Waterfront) is one such place, running along Nikis Avenue from the port to the White Tower. It has served as a parade ground for kings and a place of protest for indignant citizens past and present. Walking along the Old Waterfront with the sea to your right, you will see a stretch of apartment blocks on your left. Most of these were built in the 1970s, though a handful of eclectic-style edifices from the early 20th century are also squashed among them. The architecturally indifferent buildings near the port mostly house shipping and law offices, but the view changes dramatically from Aristotelous Square onwards, segueing into luxurious apartment blocks and some of the most expensive real estate in the city. The genius of Hébrard’s vision is best illustrated in the elegance of this strip. The ground-floor spaces of these buildings have been taken over by cafés, bars and restaurants, most of which overcharge for coffee, but make up for it with their privileged location. Not much has changed since the 20th century, when this area was abuzz with noisy traditional coffee shops and later cinemas, ideal for a languid stroll. 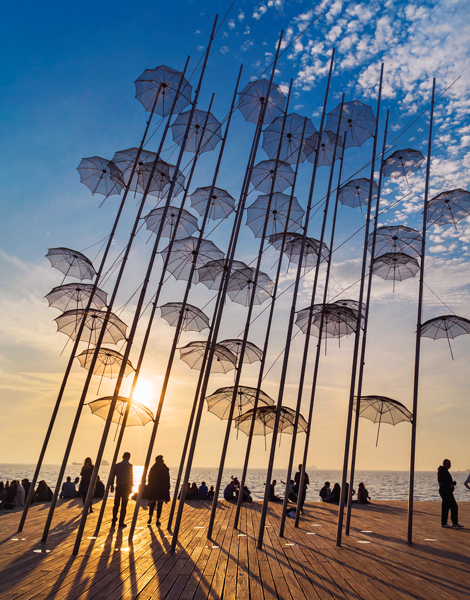 George Zongolopoulos Umbrellas, first exhibited at the 1995 Venice Biennale, found its proper place on the New Waterfront and quickly became Thessaloniki’s most popular and photographed landmark. The statue of Alexander the Great changes company during the day – in the morning it’s tourists, in the afternoon skaters and at night the party crowd of impromptu dance meets. Continuing your walk for a few minutes more will bring you to the White Tower, the city’s most emblematic landmark and museum, and the point where the Nea Paralia (New Waterfront) begins, with the rather narrow sidewalk of the older stretch giving way to a broad cobbled promenade that was built in the 1960s along with the embankment. 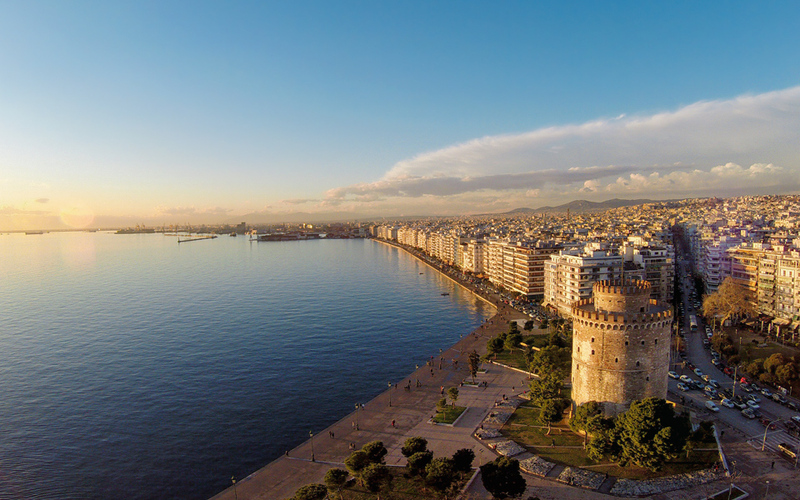 Thessaloniki turned over a new leaf on December 1, 2013, however, unveiling the New Waterfront, an ambitious renovation designed by architects Prodromos Nikiforidis and Bernard Cuomo. It was cause for celebration in a city in the grips of the severest economic crisis in modern history, with unemployment soaring to 30 percent. Residents continue to embrace the new boardwalk with as much enthusiasm today as they did when it was first presented to them, using it for free public events, many organized by the Friends of the New Waterfront Society, from fashion shows and concerts to all manner of artistic happenings – but no protests as the mayor has adamantly refused to allow political gatherings in this jewel of a location. The square at the White Tower is a popular meeting point and hangout. In the backround, one of the floating bars that cruise around the gulf. With the sound of traffic from the Old Waterfront behind you, this is where to experience a panorama of Thessaloniki’s human geography: yogis demonstrating inner-balance exercises, people taking a stroll up and down, families playing, dogs running beside their owners, elderly people chatting at “their” bench, students strumming on guitars or playing drums while drinking beer from the kiosk, joggers adding up the miles, photographers waiting for the perfect light and dozens of cyclists… cycling. The rationale of the project, as the two architects explain, was the pursuit of a new equilibrium between the seafront and the city, “balanced solutions that respect equally the citizen and the environment.” It has certainly brought a sense of equilibrium to the daily lives of residents by allowing them to rediscover the wonderful possibilities of a well-designed, thoughtful public space. One of the most fascinating aspects of the revamp is the creation of 13 themed pocket parks, or “green rooms” as the architects have dubbed them, which are interspersed with recreational areas. This stretch begins just after the Vassiliko (Royal) Theater, which hosts many performances of the National Theater of Northern Greece, with a park inspired by the statue of Alexander the Great at its center. This is one of the most photographed spots on the boardwalk, not so much for the statue itself, which was built in 1974, but for immortalizing the image of the ancient warrior who is so intrinsically identified with the broader region. Just before dusk starts to set in, the park is inundated by young skaters using the base of the statue to perform acrobatic feats, while it’s not unlikely to come across a tango class – a silver-screen moment – later in the night. Further along, three small boats wait to take you on a 90-minute ride around the Thermaic Gulf, during the summer months, just for the price of a drink. Standing atop a wooden platform, George Zongolopoulos’ Umbrellas installation draws attention, as does an expanse of dancing water fountains, the perfect spot to snap a photo. You can also rent a bicycle here from the first such facility introduced in the city and ride along the boardwalk’s bike lane. Yet another wooden platform showcasing the Moon sculpture by Pavlos Vasileiadis presents a great photo-op, while this is also a good place to grab a snack from one of the – admittedly over-abundant – street peddlers selling cotton candy, candied apples, nuts, souvlaki and even cocktails, depending on when you’re visiting. One of the most fascinating aspects of the revamp is the creation of 13 themed pocket parks, which are interspersed with recreational areas. 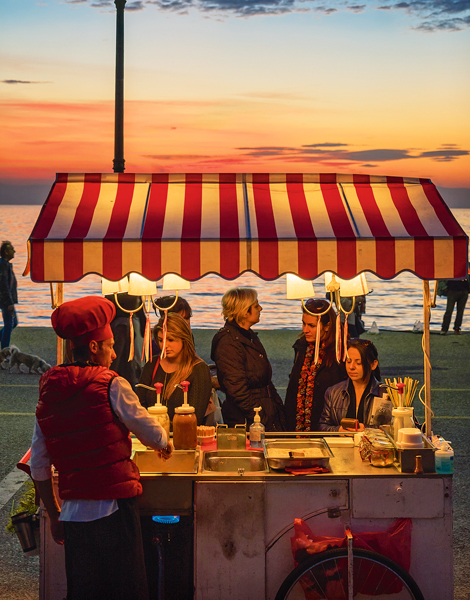 Canteens offer sweet and savory temptations across the waterfront, but “Red Cap” is famous for his honey-soaked loukoumades. 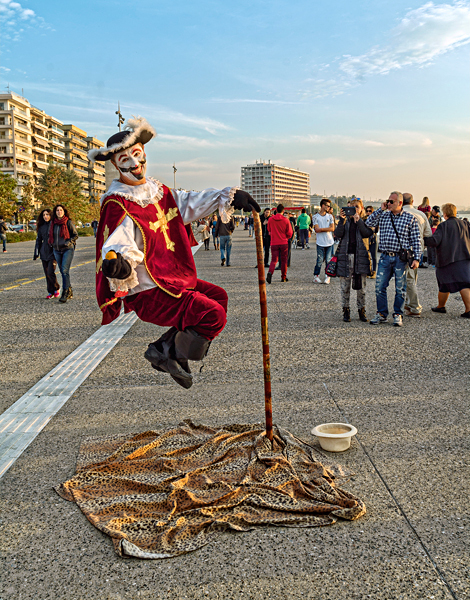 Street artists and musicians provide entertainment on the waterfront, from the port to the concert hall. The pocket parks have each been given distinctive features that define their use. The Sand Garden, for example, is a playground for kids, while the Afternoon Sun Garden has a seating area built on a gentle slope where you can read a book, catch some rays or simply chill out. The Sculpture Garden is not open to the public yet, but you can stop to enjoy the Three Circles water-powered installation by Zongolopoulos. The city’s past is showcased in the Memory Garden, a visual crack through which you can view a beautiful neoclassical mansion that stands above the waterfront and is home to the National Bank Cultural Foundation, organizer of numerous interesting exhibitions. There is a refreshment stand under a pretty gazebo that also hosts art exhibitions in the summer and a dancing fountain area where kids like to play on a hot day. The last garden is dedicated to music and marks the end of the boardwalk, adjacent to the Thessaloniki Concert Hall. This is another fascinating architectural landmark that consists of two separate buildings. The first, M1, is a nod to the city’s Byzantine past, while the second, M2, is a modern structure designed in simple geometrical lines by the acclaimed Japanese architect Arata Isozaki. 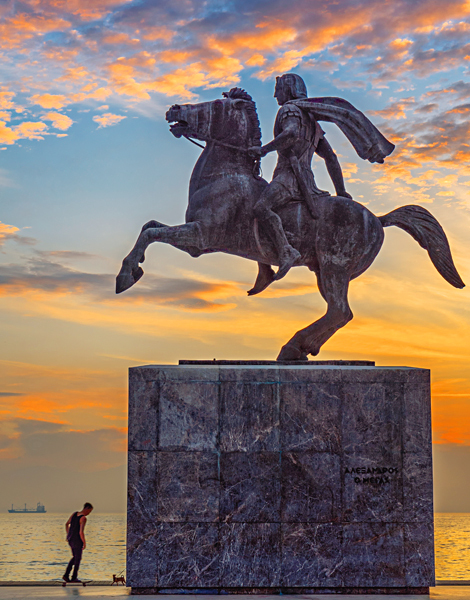 The ideal time to start your 5k stroll along Thessaloniki’s seashore is about an hour before sunset so that you can take in all the sights and sounds, and reach the end in time to watch the sun go down over the Thermaic Gulf. This is a great city to get around by bicycle, and particularly along the waterfront, where there’s a proper, 5k cycle path. To learn about the best routes and rent a one – two- or even four-seat bicycle, visit www.ibike.thessbike.gr and www.bikeitrentals.com. The Thessaloniki Concert Hall hosts music, theater and dance performances all year round, though its agenda is much more varied in the winter. For details, visit www.tch.gr.